Australian opal cuff bracelet with sugilite, chrysoprase and chalcosiderite. Our Products >> Cuff bracelet with sugilite, chrysoprase, opal, chalcosiderite. 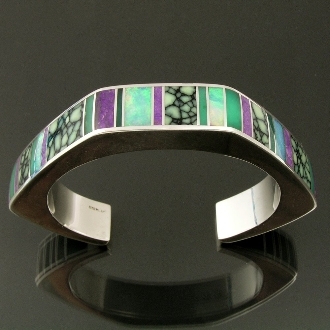 Mark Hileman sterling silver bracelet inlaid with sugilite, Australian opal, chrysoprase and chalcosiderite. The bracelet is pentagon shaped and is 22mm wide. Stamped "sterling" and signed "MMH" by Mark Hileman. The bracelet in the photo has sold but a matching one can be special ordered and completed for you in 4 to 6 weeks.